We offer windowed free space cells in a variety of configurations for wavelengths into the Mid-IR. These cells are made to order with choices in tubing diameter, cell path length and window material. Note that for HF gas we use a copper cell construction. Glass Tubes: We use soda lime glass cut for 1cm to 50cm path lengths. Available diameters are 5, 9, 12, and 25mm. Windows: Choice of windows include AR-coated B270 glass, MgF2 or ZnSe. Windows are wedged and fritted to the tubes at a small tilt to minimize interference effects. AR Coating transmission curves are available upon request. Gases: Common reference gases include ammonia (NH3), acetylene (C2H2), hydrogen cyanide (HCN) and methane (CH4) among many others. These can be provided in mixtures and in concentrations with a nitrogen backfill (740 Torr max pressure). We cannot provide atomic vapors. Please see our Absorption Tube Info Sheet to design your own custom Free Space Absorption Cell. A list of currently available gases is available upon request. Please don’t hesitate to contact us with your specific needs. 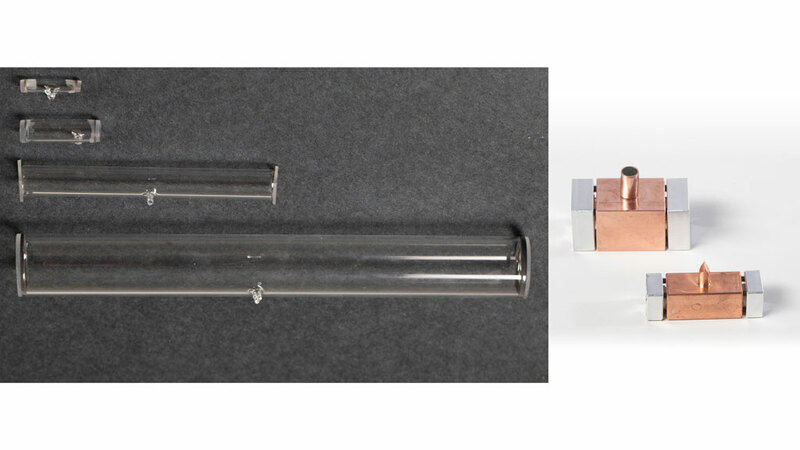 For our HF Reference Cells we use sapphire windows compression sealed to a copper housing. Cells are 2.7cm path length and can be either 5mm or 10mm clear aperture. Please refer to our package drawings for more information. Please contact us directly for your HF Reference cell needs. Online ordering is not available for free space reference cells at the moment. Please contact us with your requirements at sales@wavelengthreferences.com and we will issue a quotation.